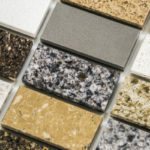 Before you start picking out the countertops, cabinets and floors for your new kitchen you need to give your overall kitchen floor plan some deep thought. The actual layout of your kitchen will greatly impact how well the space functions and flows. No matter how beautiful your kitchen is it must be functionally laid out or else it’s all for nothing. 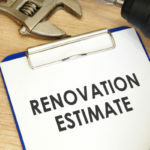 The best kitchen remodel floor plan for you depends on the square footage you are working with as well as how much you plan to change your current kitchen footprint. If you plan to knock down walls or move appliances you have more freedom to create the floor plan of your dreams. If you are trying to keep remodeling costs down you might instead want to work with the floor plan you already have as much as possible. -Do you mostly cook alone or with someone else? -Do you often host dinner parties and entertain? -Is the kitchen a gathering place for your family and friends? -Do you want people sitting in the kitchen while you cook? -Which kitchen appliances do you use the most? The National Kitchen & Bath Association (NKBA) provides a list of guidelines for remodeling your kitchen layout. These guidelines can help you create a more functional space. For instance, if your future kitchen will only have one sink the NKBA recommends it be placed across from or next to your cooking surface and refrigerator. 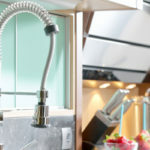 The kitchen sink should also include surface space on either side measuring at least 24-inches wide on one side and at least 18-inches wide on the other side. The NKBA also has guidelines for dishwashers, which should be placed about 36-inches from your cleanup/prep sink. Thinking ahead of time about how you will use all of your appliances in conjunction with one another will help you create a convenient kitchen floor plan that works best for you. Here are 6 of the most popular kitchen floor plans proven effective, starting with the most basic and moving on to more elaborate layouts. We have heard about the ‘triangle floor plan’ for as long as we can remember but the basic premise behind this design still rings true today. This floor plan includes placing the most commonly used appliances (the stove, refrigerator and sink) at the corner points of an imaginary triangle in order to provide maximum efficiency. This is still an important tip to keep in mind but a few things have changed in recent years. For one, we use more appliances than ever and many families have more than one cook in the kitchen at once. While the triangle is still something to keep in mind it as not as mandatory as it once was. If you have a smaller kitchen and only one main cook in the house the triangle layout is still very useful. On the other hand, if you have a lot of cooks and a lot of work space in your kitchen you might want to go for a different layout that works better for you. Single wall kitchens are very common in smaller spaces such as condos, studios or apartments. Just as its name suggests, this kitchen floor plan includes all of the main appliances (cabinets, counter spaces, fridge, dishwasher and stove) located along the same wall. This type of kitchen can easily blend into smaller spaces for efficient use but a less obtrusive footprint. In most cases with a single wall kitchen it is best to have the sink fit in between the fridge and stovetop for easy cleanup as well as a nice balance. The great thing about a single wall kitchen is that everything you need to cook and clean is located in close proximity for high efficiency. Also, by turning your kitchen into a single wall space you may open up room to add an island for extra cabinets, countertop workspace and bar seating. This is especially useful because one of the biggest drawbacks to single wall kitchens is a lack of countertop space for prep work. The galley kitchen resembles a long and narrow hallway with cabinets and countertops on both sides of the kitchen. This straight lined kitchen design offers a lot of ease when it comes to preparing food because everything is easily within reach. A galley kitchen makes a great layout if you are working with minimal amount of space. While people often look down on galley kitchen design it is actually the most popular design used in commercial kitchens because of its efficiency when properly set up. The main drawback to a galley kitchen is feeling closed off from the rest of the home. Open up your galley kitchen by adding windows that open up to the outside or to larger living areas in the house. You can also get creative and add bar seating near the front or back of a galley kitchen (depending on available space) so that you can entertain and socialize while cooking. Since the standard galley kitchen does not include a hang out space for family and friends you can make yours stand out by incorporating that into the design. Most galley kitchens are designed with the sink and range on opposite sides of the kitchen. This increases the efficiency of your workspace but this can also get in the way of your flow. Think about how you will use each appliance in your kitchen before deciding where to place it. Also, focus on keeping both ends of the galley kitchen open to prevent creating a dark and unfriendly space. The U-shaped kitchen is often referred to as a “glorified galley kitchen.” It offers a more modern floor plan that has evolved out of a need for additional space in the kitchen. The U-shape gives you tons of space for countertops and cabinets because you have 2 long walls and one shorter wall to work with, plus all of the space in the center of the kitchen where you might even have the room to add an island. The U-Shaped kitchen is often used when working with smaller square footage, but can be expanded to fit a larger home as well. You can add seating to one side of the open wall in order to make your countertop space double up as bar seating. The L-Shaped kitchen is designed to look just like the letter L, with one long wall of cabinets and a smaller adjacent wall of countertop space and cabinets. It is common to add a center island to the L-shaped kitchen in order to add more prep space. The L-shaped kitchen usually includes the refrigerator and sink on one wall with the stove found on either the shorter or longer wall. The kitchen is the heart of the home so if you’re looking for a way to open up your kitchen the L-shape is a great choice. There is usually very little space for multiple people to move around in an L-shaped kitchen but since it is so open you can add surrounding space for family and friends to congregate. For instance, adding chairs to your center island is the perfect solution to making this open floor plan more accessible to others. L-shaped kitchens take up little square footage and can be tucked right into the back corner of any space. Despite their small size they offer a lot of convenience as well as the open floor plan the masses are seeking these days. If you have a large kitchen floor plan you might be interested in the new ideas behind what is called a “zoned” kitchen. This type of kitchen is broken up into different zones such as food storage, cleaning, food prep, coffee, juicing, etc. This type of floor plan allows more than one person to get stuff done in the kitchen without getting in one another’s way. This floor plan also helps people remain more organized, which is good for the every day appearance of your kitchen. The only downside is that kitchen prep stations are not exclusive. In all reality you are going to experience a lot of overlap with your different workstations. Keep this in mind when designing a zone kitchen so that you do not end up creating a counterproductive workspace. Kitchen islands are the perfect addition to any kitchen layout, they add informal bar seating, a place to prep food, store certain décor or appliances—such as a mixer or blender, and can also serve as a way to incorporate more drawers and cabinets. If you plan to add a kitchen island you will need to plan for 42 inches of space on all sides of the island. 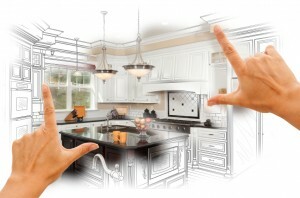 Before you start your kitchen remodel take the time to visualize yourself in the kitchen. This type of imaginary play will help you uncover what you do or don’t need to add to make your kitchen function best. 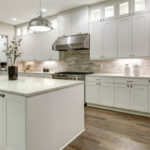 Tops Kitchen Cabinet offers wholesale kitchen cabinets, granite countertops and more so that you can install the kitchen of your dreams on any budget!